Based off of Rick Riordan's Greek stories, this site is a role-playing forum based off of the idea that half-bloods can also be half Titan, half Mortal. Powers: Think.....of the movie the mask! anything he can do...she can do. Life Before CHT: Her mother put her in a insane asylum. 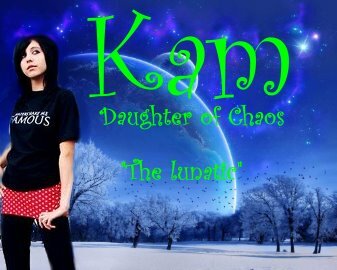 Kam would luagh after she through her mother at a wall. Kam would throw clocks at her moms boy friends. Once Kam hated this guy so she made a pink toilet appear and through it at his head, Knocking him out. She laughed. Thats when her mom put her in a insane asylum, then someone came and brought her here. That was less than a year ago. Beware though, she could find you and then you'll see the definition on crazy. RP Example: My eyes wiendend I smiled evily. I started giggling as I made a fox fight a fish, but the fish won!!! I giggled more then whislted. Maple my magical ponie came over, she was a mp that I got after visting China! She was attcaking there and I helped. I giggled more and got on her back, her hooves sparkled and hercolorful rainbow wings shined. "TO THE FOREST!" I shouted. Maple nodded and flew towards the forest. I giggled more cathcing some trees on fire with a toothpick. Note to self: Stay away from this one.